But I knew for sure that I wanted to see some ruins. 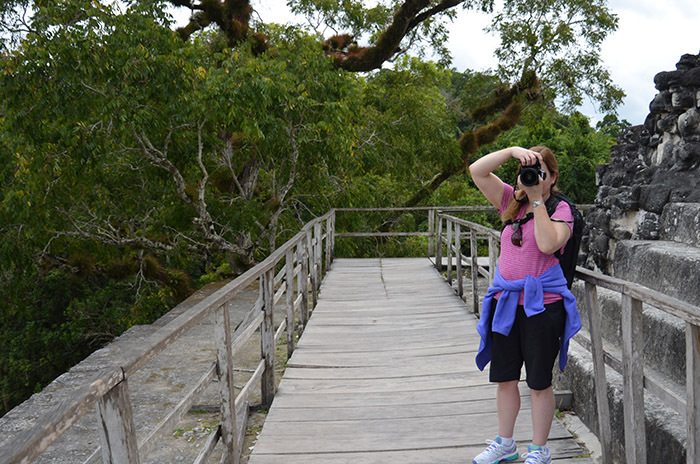 Now, we knew that Black Rock Lodge was close enough to the Guatemalan border that crossing it to see Tikal was a reasonable distance – but we agreed that it wasn’t our top priority as going across another border sounded unnecessarily complicated. 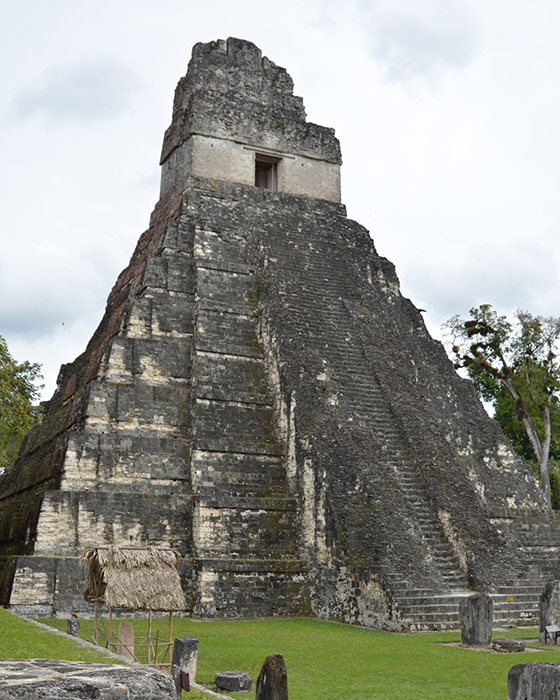 Well, when we expressed to Petro, the manager at Black Rock, that we’d like to see ruins, she recommended Tikal without missing a beat because 1. the two-and-a-half-hour drive (each way!) is on paved road, and 2. there was already a group planning to go the following day. Going across the border was not nearly as complicated as we’d imagined because Fernando, our guide from the lodge, basically held our hands and walked us across, and both Belize and Guatemala are happy to let tourists cross their borders as they charge a small fee to do so. 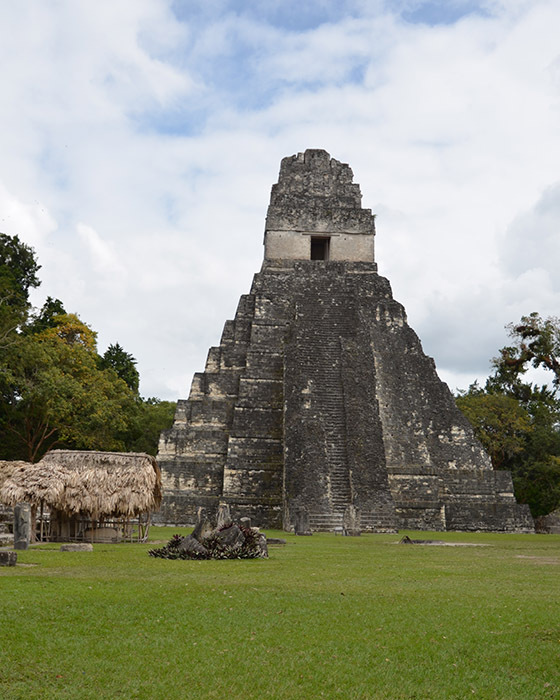 So, it’s taken me two weeks longer than I thought to get this post together, mostly because I haven’t known where to even begin to tell you about Tikal. There are so many details I want to share (and remember) but now I’ve put it off for so long that I’ve already started to forget. I’ll start by telling you about the park itself. It’s enormous – 575 square kilometers (roughly 142,086 acres.) I had my phone in my camera bag, and it logged 13,786 steps that day (and surprisingly, only 13 flights climbed – I felt like we were climbing stairs and walking uphill constantly! I average more flights climbed going for a walk to the park in my neighborhood.) 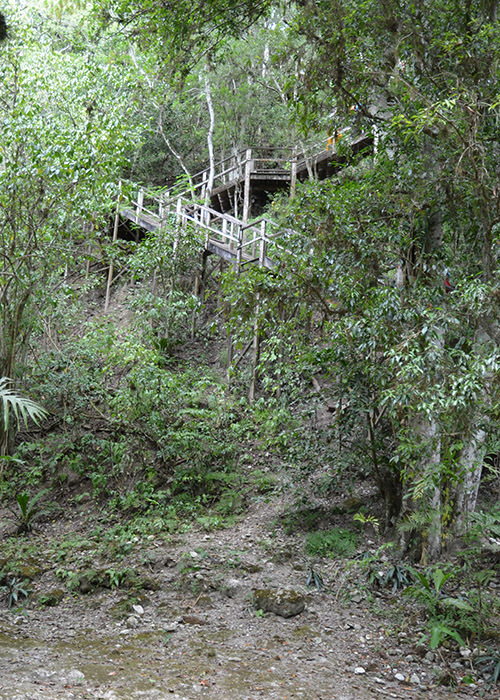 It’s home to jaguars, but we didn’t see any because they are of course nocturnal. 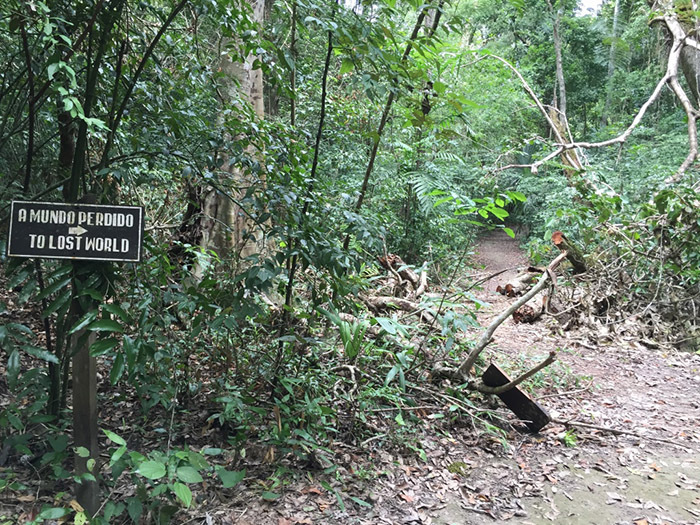 Being in the middle of a jungle, there are months of flooding, followed by months of drought. 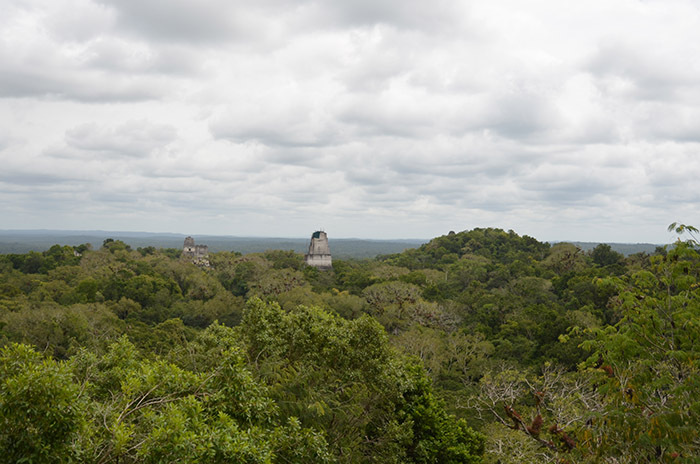 The Maya who cultivated the site which is now known as Tikal learned to deal with this by building reservoirs and collecting rainwater. Here’s a manmade reservoir, now home to crocodiles. Only a small fraction of the Mayan structures have been excavated, and we walked a big loop through the park to see them. 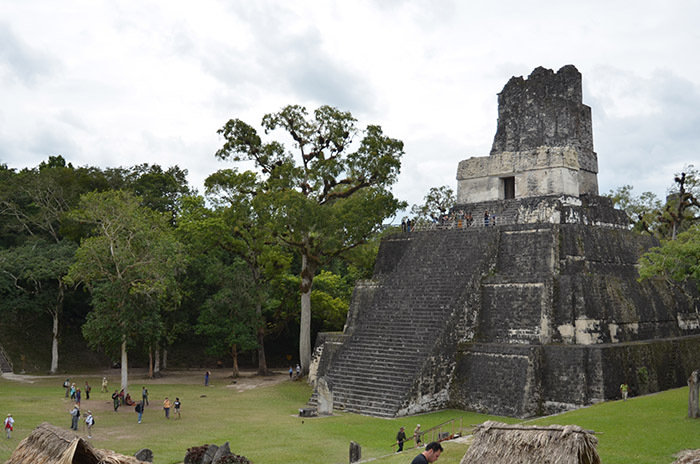 We continued on the loop to the next temple: one that brought a lot of attention to Tikal and Guatemala, because it was used as a filming site for Star Wars: A New Hope. 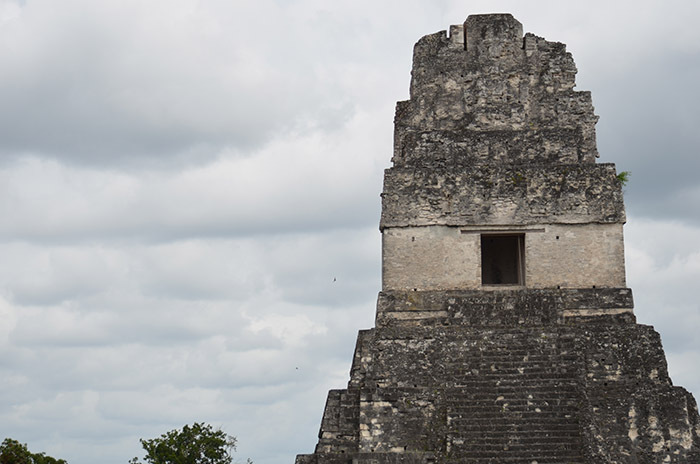 That temple has been partially excavated, and a staircase built around it, so that us tourists can climb up and enjoy the view and only minimally disturb the original structure. 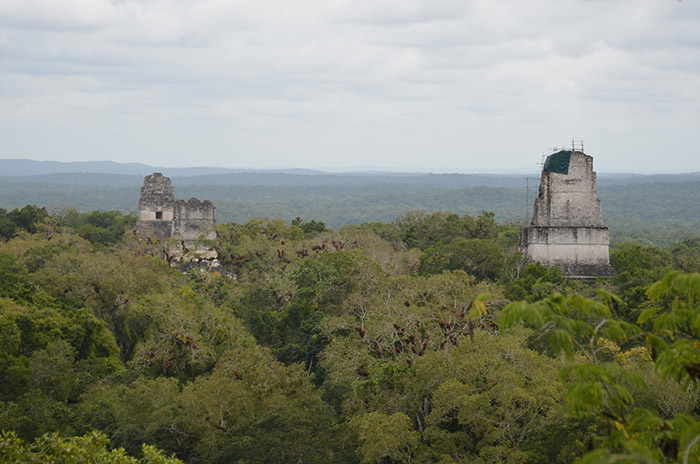 As you can see, one of those temples is currently undergoing restoration – that’s Temple III, which we went to next. Further in the distance are Temples I and II, which were our last stop of the day. Here’s another, smaller building that was only partially excavated. 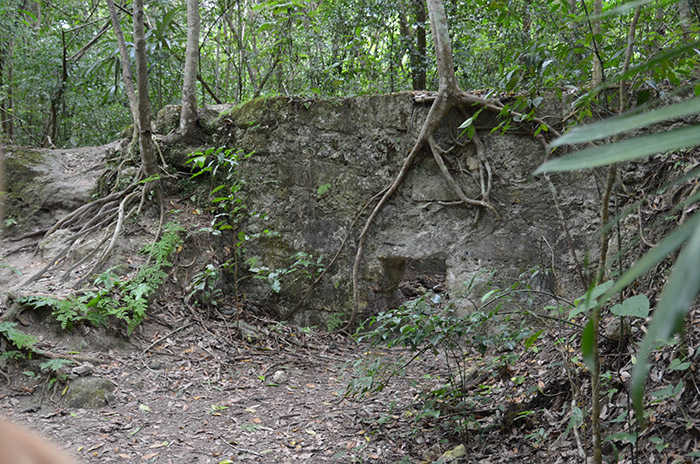 This one really shows how the vegetation overtook the structures. Then we set off to the main plaza, and Temples I and II. 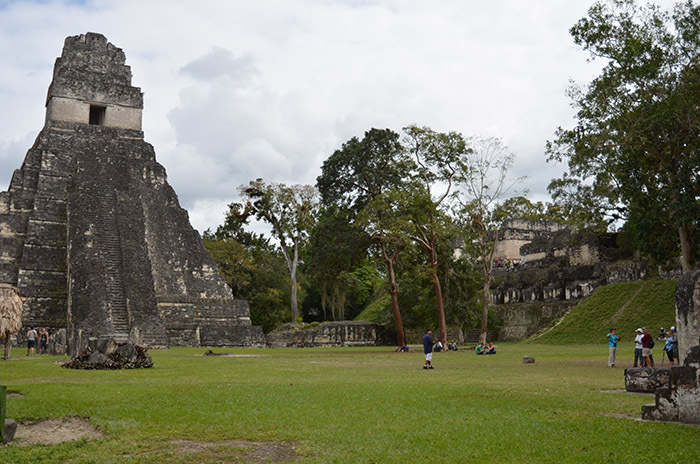 Here’s the main plaza, and Temples I (left) and II (right.) Both were commissioned by the ruler known as The Great Jaguar. He was entombed in Temple I, and his wife in Temple II. 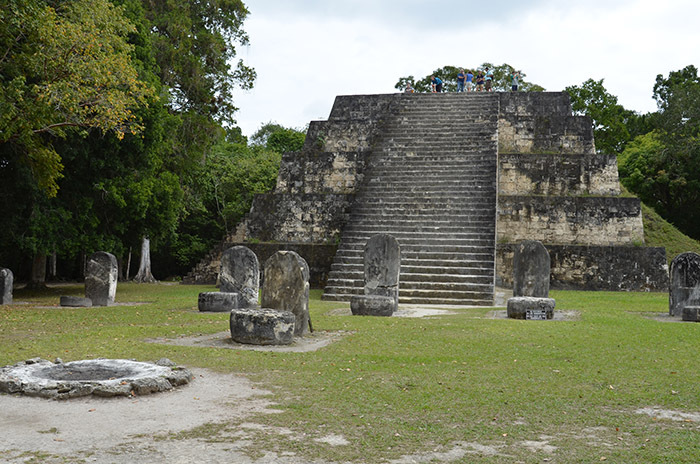 According to our guide, he was the only Mayan ruler who had a temple built for his queen. 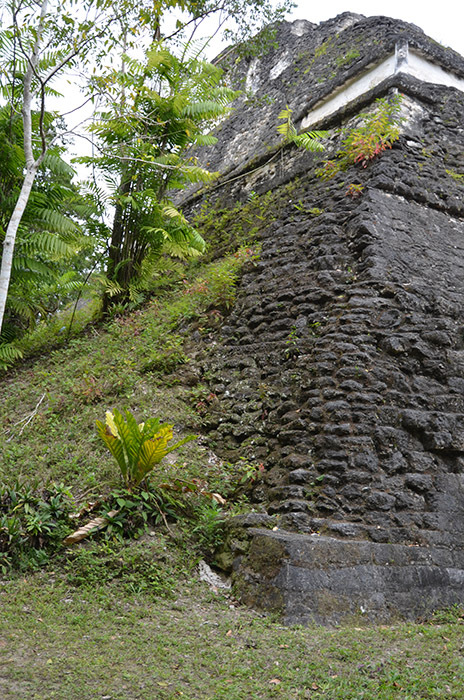 The temple has nine levels, one for each of the layers of the Mayan Underworld. 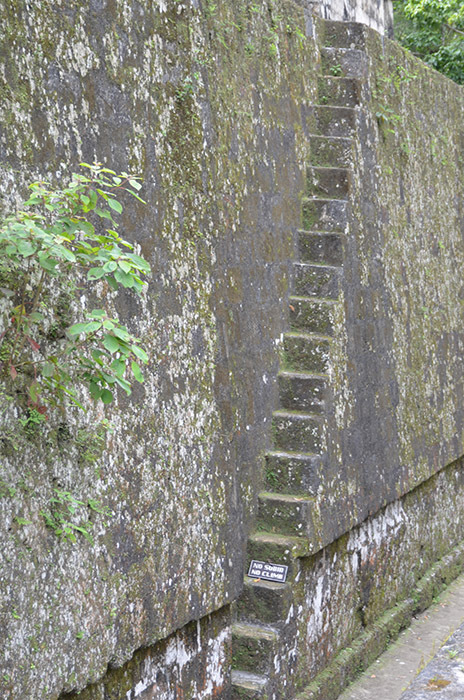 All of the temples had these tiny, narrow sets of stairs up the side. Our guide explained that they were used by the warriors who protected the temples so they could hastily get to the top. These are on Temple II – obviously, we were not allowed to climb them. Well, I’d better get back into the groove of regular blogging so I can write the rest of my Belize recaps before I forget everything we did and saw! 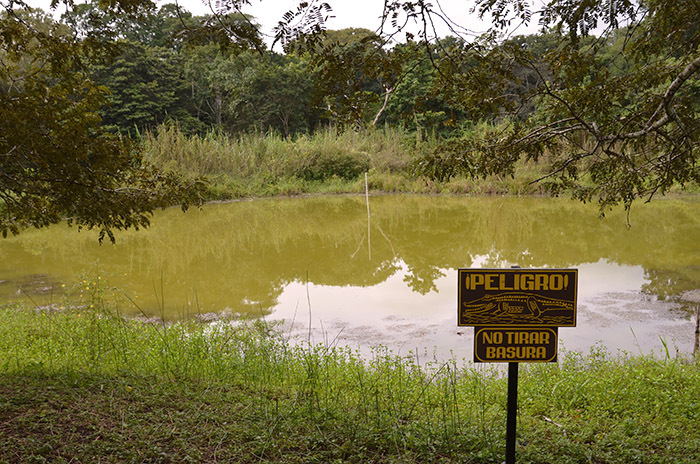 Next week – the Belize Botanic Garden.